It counts among its members CDM Smith, E-Z Pass and HNTB, another consultant company active in Connecticut politics that specializes in architecture and construction management. According to IBTTA Communications Director Bill Cramer, CDM Smith is a “sustaining member” of IBTTA, meaning CDM Smith brings in more than $5 million per year in toll-related income and pays $18,000 per year in dues to IBTTA. CDM Smith, HNTB and E-Z Pass have been instrumental in developing the tolling studies for the Connecticut Department of Transportation and pitching it to the public. CDM Smith authored tolling studies in 2015 and 2018, positing the number of electronic tolling gantries which could be placed on Connecticut’s highways, estimating construction and operating costs, toll rates, the amount of revenue which could be collected and the number of out-of-state drivers who would pay the tolls. CDM Smith’s 2015 toll study estimated between 78 and 121 toll gantries collecting 10 cents per mile to bring in $1.2 billion per year, 30 percent of which would come from out-of-state residents. However, when several tolling bills failed to come to a vote during the 2018 legislative session because of public resistance, CT DOT returned to CDM Smith for a second study in an effort to lower the toll rates and make the plan more palatable to the public. The second study posited 82 tolling gantries and factored in toll discounts for in-state drivers through a Connecticut-specific E-Z Pass, massaging the per-mile rate down to between 4 and 5 cents per mile and increasing the amount of revenue to be drawn from out-of-state drivers from 30 percent to 40 percent. The 2018 study was withheld from the public until nine days after the 2018 election, despite former DOT Commissioner James Redeker’s testimony before the State Bond Commission which cited the study’s figures. HNTB hired Roy Occhiogrosso, former senior advisor to Gov. Dannel Malloy, to lobby the state Department of Transportation, and who, along with several other marketing firms, created a playbook for selling tolls to the public, according to Hartford Courant investigative reporter Jon Lender. Likewise, CDM Smith hired a lobbying firm with ties to the Lamont administration in February of this year. Aside of the tolling studies, CDM Smith has stayed out of the limelight of the toll debate, but IBTTA CEO Patrick Jones came to Connecticut from Washington D.C. to testify in support of tolling Connecticut’s highways, echoing the pitch from Gov. 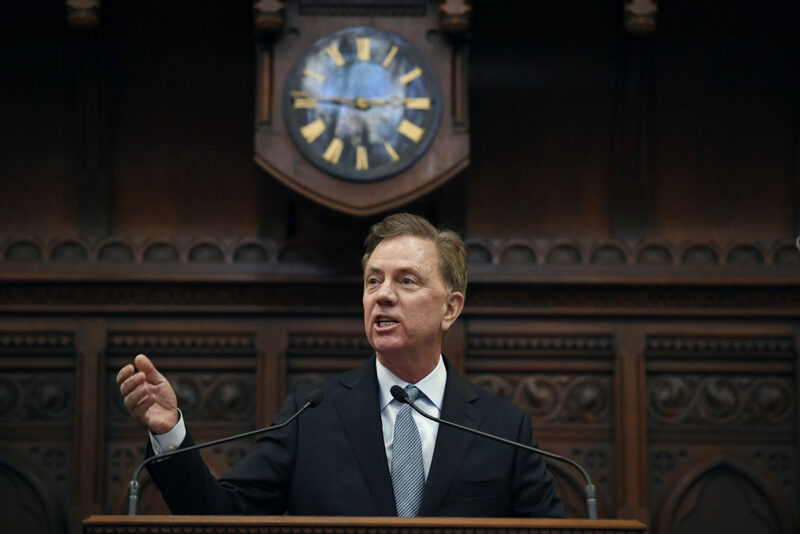 Ned Lamont and other pro-toll lawmakers in his 2019 written testimony. Sources indicate Jones was escorted to the Transportation Committee hearing on March 6 by Lamont’s people and had been meeting with them previously. It wasn’t the first time IBTTA has testified in support of tolls in Connecticut. IBTTA’s website features CT-N video of Jones testifying in person before the Transportation Committee in 2015. Naturally, IBTTA’s members stand to benefit from the implementation of tolls and, in particular, CDM Smith stands to benefit through more consultation and contract work. Since 2013, when CDM Smith was first tapped as a consultant for Connecticut’s push for tolls, CDM Smith has been paid $15.3 million for various contractual services with CT DOT, according to the state’s transparency website. In a 2013 interview with the Stamford Advocate, CDM Smith engineer and consultant Ed Regan said that “relying on the gas tax is increasingly unsustainable,” and noted that states around the country are seeking lesser restrictions on tolls. At the time, CDM Smith contracted for $2.2 million for two tolling studies: $1.4 million for a study of congestion tolling on I-95 and another $800,000 for a tolling study in the Hartford area. Their 2018 study cost a little over $2 million to produce, according to an email from CT DOT to former Sen. Len Suzio, R-Meriden, who was denied a Freedom of Information request for the study prior to the 2018 election. In 2016, CDM Smith was also tapped for “preliminary engineering and design services” for improvements to an 8-mile stretch of I-84 between exits 3 and 8 in Danbury, according to the CT DOT’s consultant selection record. Similarly, HNTB was hired in 2016 to provide engineering services for replacement of the Mixmaster in Waterbury. The I-84 project cost is estimated at $1.5 billion, while replacement of the Mixmaster is estimated at $7 billion. Both projects were labeled “at risk” in 2018 when Gov. Malloy announced the Special Transportation Fund was in trouble and began his biggest push for tolls. A bi-partisan budget adjustment enabled those projects to continue a slow move forward without tolls by transferring vehicle sales tax revenue into the STF and dedicating $250 million of General Obligation bonds toward transportation to keep the STF solvent. But that fix lasted only one year before a renewed push for tolls was taken up by Gov. Ned Lamont and Democratic leaders in the House and Senate. The Danbury I-84 project and the Mixmaster replacement were included in a list of potential toll-funded projects passed out of the Transportation Committee as part of an overall tolling bill. Both CDM Smith and HNTB stand to make a considerable amount of money from those projects, but whether the state can afford them at the moment is the biggest question — one which has launched the state government’s biggest push for tolls to date. Gov. Lamont needs the toll revenue because his budget relies on diverting the vehicle sales tax revenue from the STF, essentially bankrupting the fund by 2021 – a risky move when even the rosiest of scenarios predicts the tolling infrastructure couldn’t be built and operational until 2023. The federal government would have to approve Connecticut’s tolling plan. To date, no state has attempted anything like what is proposed in Connecticut. Even congestion tolling is limited to high-occupancy vehicle lanes and new construction. No state has ever attempted to toll every lane, every mile of interstate highway. If enacted, however, toll revenue is estimated at between $800 million and $1 billion per year, depending on which numbers, study or plan one consults, and that is a lot of money on the table for companies which profit off tolling infrastructure, architecture, consultation and construction. 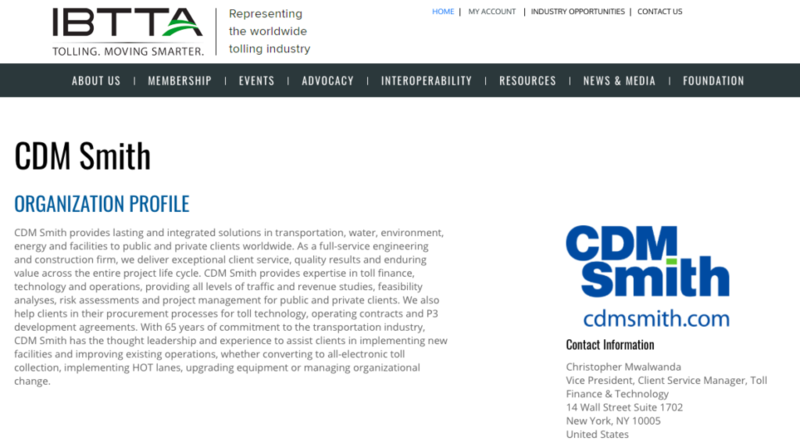 CT DOT Spokesman Kevin Nursick said there is nothing unusual about CDM Smith’s membership in IBTTA, likening it to any association of businesses – the Connecticut Business and Industry Association, for example. Consultants like CDM Smith are chosen by a “consultant selection panel” based on their “ability to expertly complete the task,” Nursick said. This type of “qualifications-based” selection process for professional services is required by both state and federal statute and the Federal Highway Administration. The panel is kept secret to prevent outside influence. State statute permits the withholding of records during the contract award process to protect the department’s bargaining power. While the panel’s meetings are not subject to state Freedom of Information laws, but rather the commissioner must prepare a memorandum of his or her decision after the fact. The cost of the consultant is not factored in to the selection process until after the panel’s recommendations are made to the CT DOT commissioner — also a matter of state law. That goal for several years now, spanning two governors and an election sweep by Democrats in 2018, is highway tolls. The push has also been backed by construction labor unions who also see the opportunity for more construction work. 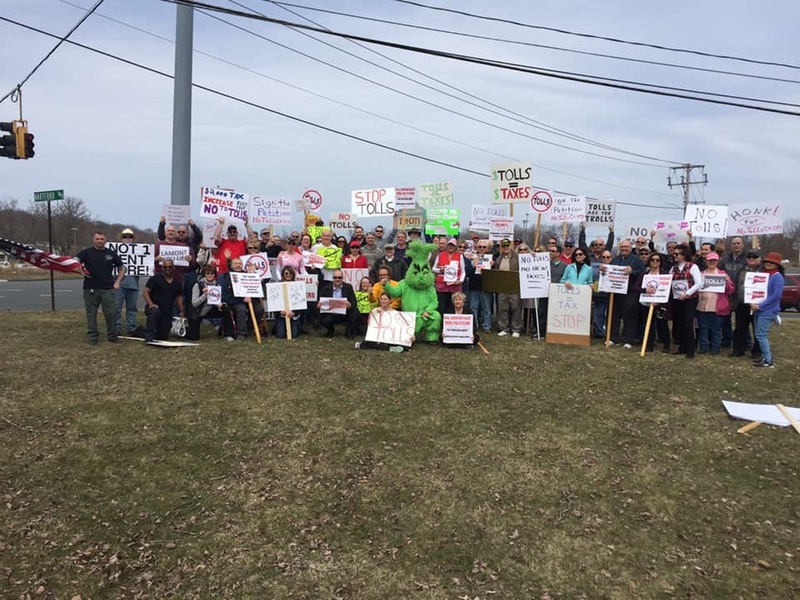 Fairfield representative and ranking member on Connecticut’s Transportation Committee Laura Devlin, said she is concerned about the potential for companies and individuals profiteering off “another tax” on Connecticut residents. To me, the concerning thing is that the most vocal proponents for tolls are those who stand to benefit financially. “To me, the concerning thing is that the most vocal proponents for tolls are those who stand to benefit financially,” Devlin said. That financial benefit has been called into question in tolling debates in other states, and scholarly journals have found tolling consultants often paint rosier pictures of revenue and expenses than bears out in reality. Scholarly reviews of tolling projections show there exists an “optimism bias” in many of the studies conducted by consultant organizations. A 2011 report by the Transportation Research Board found administrative, operating and collection costs for toll facilities were 33.5 percent. CDM Smith pegged the administrative and operating costs at “just under 10 percent of gross annual toll revenue,” or about $100 million per year. The Denver Post wrote that “cases where the consultants doing the revenue and traffic forecast either had an interest in seeing the road get built or were later awarded additional work on that road” or “where the road’s revenue projections were used as a negotiating tool to secure favorable financing terms rather than as an impartial scientific study,” were especially troubling to investors. But Connecticut is not discussing construction of a new road or bridge or adding additional lanes which would be tolled. Rather, Lamont and some state lawmakers are looking to toll every lane of existing highway extensively – something that has never been done before and is considered “new territory,” for the Federal Highway Administration. Tolling Program Manager for the FHWA Center for Innovated Finance Support Cynthia Essenmacher said the agency has an unofficial and unpublished set of guidelines to determine how and to what extent existing highways can be tolled under the Value Pricing Pilot Program – the program Connecticut seeks to use — but can’t give out more information. In their 2015 and 2018 reports, CDM Smith assumes Connecticut’s tolling plan would be approved by the FHWA, but there are no guarantees. CDM Smith’s report also back-pedals some of the assumptions made, not only in its report, but assumptions by state lawmakers who believe Connecticut could have tolls within the next few years. “The reality is there remains a substantial amount of additional information that would be required to support a future decision by the Legislature on whether to authorize tolls in Connecticut and to obtain the required approval by the Federal Highway Administration to implement tolls,” the report said. 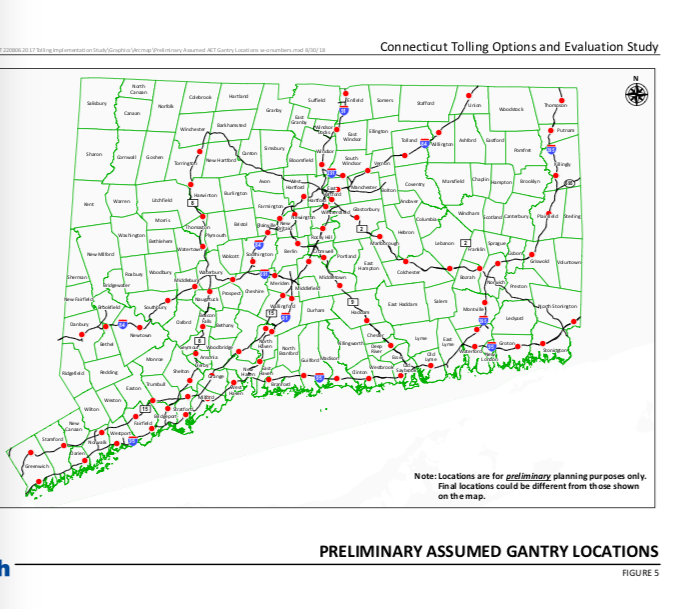 In order to gain federal approval, Connecticut would have to approve a tolling plan with gantry locations, conduct an Environmental Impact study to determine how that plan would affect residents and businesses, engage the public and prepare the preliminary design documents, among other things. Gov. Dannel Malloy forced through a $10 million bond for that study in July of 2018, but without a final tolling plan approved by the General Assembly and the governor, the study cannot be conducted. In response, lawmakers have attempted to fast-track approval for a tolling plan. As part of one tolling bill passed by the Transportation Committee, a tolling plan submitted by the CT DOT would be “deemed approved” after 15 days if it is not voted on by the legislature. Gov. Lamont recently made a trip to Washington D.C. to discuss his tolling proposal, although the results of that meeting have not yet been reported. Lamont has also signaled that he is willing to “compromise” on his tolling plan. But anti-toll activists don’t appear to be buying it after Lamont’s flip-flop on tolling only large trucks. Despite public opposition in 2018 and 2019, the wheels of state government, backed by major business interests, continue to turn and push forward, trying to sell an idea to the public which may just be fantasy: namely, that an extra $1 billion per year in toll revenue will suddenly solve many of Connecticut’s ills. The truth of the matter may be much different. The scenarios painted by politicians, lobbyists and industries who stand to reap millions will likely not live up to the hype – and that could be problematic for both commuters and Connecticut’s finances. When there is $1 billion per year on the table, along with ability to leverage more bonding, potential Wall Street investment and federal grants, a lot of interested and powerful politicians and companies sit down and start planning their future. Unfortunately, the people who will actually pay that $1 billion per year are also sitting down at the dinner table and planning their future in a state with high taxes and a high cost of living. With the potential to increase the cost of nearly every good and service in the state, having to pass under a toll gantry every six miles may be the tipping point for some Connecticut families. Whether that tipping point means wild voting swings, protesting, or just plain packing up and leaving is anyone’s guess. But with toll revenue potentially up for grabs for a number of different businesses and consulting companies, it can be certain that those businesses and consultants won’t be walking away from the toll debate — or the Capitol — any time soon. to my family jumps to $982.86 a year to drive on roads that decades of paying taxes already helped to build and maintain. Tolls with tax credits always have additional costs for infrastructure, personal and running associated with it that will increase taxes. It cost over two million for the report about possibly installing tolls. All residents will have additional hidden toll fees passed on to them in the increased prices of goods and services. Patrick Jones, CEO, IBTTA, do you have ties with the Governor? The way you censor comments would indicate that you do. 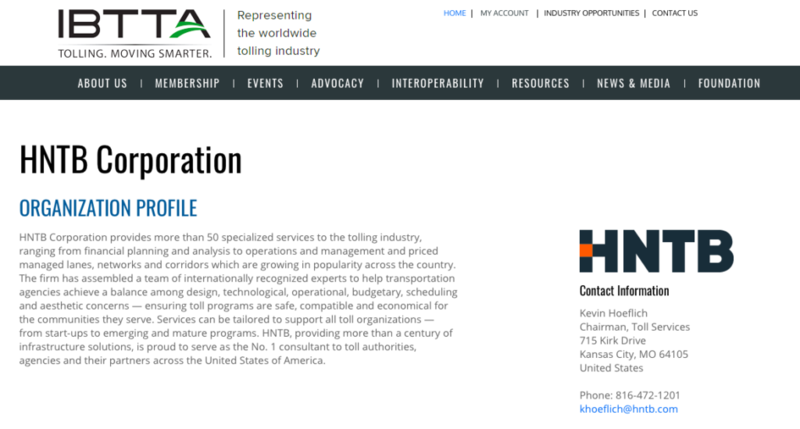 Are you surprised that Tolling Study Consultants has ties with the Governor? I’m not. That is the way he operates. The Governor should be censured for not being honest with voters during the election period. Obviously there should be consequences for his misrepresentation of his goals. Why hasn’t the Ethics Committee looked into this as there seems to be an obvious misrepresentation of what he said to get elected. Just my opinion. Why hasn’t the Ethics Committee acted to the Governor’s unethical way he won the election? for his dishonesty? Again, why hasn’t the Ethics Committee taken action? Probably because his party runs the committee. This man is a sham and should be treated as such. This is only my opinion but I bet there are other who feel the same. The level to which our politicians go to be disingenuous is astoundingly sickening! It doesn’t matter how much the toll plan is tweaked….we are opposed to the ENTIRE IDEA OF TOLLS! We are quickly approaching number 1 in the country for 2 things, taxes and residents moving out. Neither of which we can even remotely be proud of. disingenuous and hypocritical Governor who was elected by deceiving the voters. If he gets his way with the toll situation many people will be affected by the cost. is using the tolls as a quick fix and not thinking about those who will suffer from it. Marc, please contact me and I’ll be happy to fill in parts of your story. No, Patrick, reply right here so we can all see it. No more hiding!